Love hunting ducks but want to learn a little more? If you are new to duck hunting and would like to know a bit more about duck behavior, then you have come to the right place. Click on any picture and you will be directed to my delicious and succulent wild duck recipes. These recipes work for wild and domestic duck if you were wondering. We are going to learn some duck talk - so I am giving you the first quick lesson before we talk about hunting ducks. When we say "duck" it usually refers to a female and "drake" refers to the male. Easy. I will use the work duck throughout this page instead of saying drake and duck hunting. Okay? I am going to talk about some of the dabbling and diving ducks on this page, along with pictures for duck identification purposes. Easy to identify when scouting or hunting ducks. DABBLING DUCKS or known as "Puddle Ducks"
These ducks tip, versus swimming underwater and diving to search for food in the water. The most popular duck in this category is the mallard duck, so I will cover this popular duck first. It's not often that I can see the color on the hen's wing...the mallard drake we all know is colorful, but the female swimming on the water just looks like she's drab brown with no coloring. But there is. 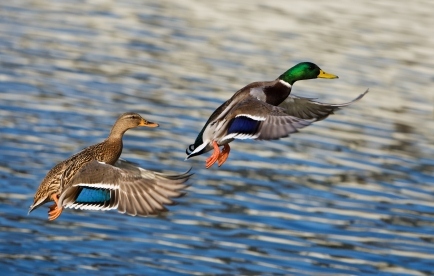 Take a peek below of the mallard drake and hen picture and see the patch of blue-purple on her wing feathers. I just wanted you to be aware of this marking when hunting ducks. That picture is a familiar sight to many; a drake mallard's green head and yellow bill. As a matter of fact, the mallard duck is considered the WORLD'S most abundant duck with the widest raging habitat. Easy marking to see when hunting ducks. Also known as "green heads" the mallards will dip their head under water, tip (over) and be hind-end up but will rarely dive into the water. They feed on small fish, frogs, tadpoles, worms, leeches, grain, berries, nuts and plants. They usually build their nests on the ground and she lays approximately a dozen eggs. Incubation is just under a month long. When she leaves the nest she covers her eggs with a layer of feathers. After they hatch, the ducklings (also known as brood) will follow the mother and waddle (walk) to water right away. They also will learn to fly when they are just under two months old. The drake has long left the nest and hooked up with other drakes in a bachelor like group. 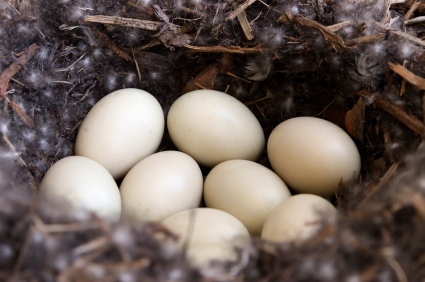 The picture below is a mallard duck nest. The wild duck chooses a mate and stays with him for the entire season. Domesticated ducks change mates between broods. Mallard and wood ducks have been known to have more than one brood during the season. Double brooding reasons vary such as: the age of the duck, first brood was very early in the season, length of the breeding season or if the first brood was lost. Wood ducks double brood more often in the southern states where the breeding season is longer and food is available, with warmer spring temperatures. ALL ducks lose their flight feathers. The drakes lose them just after breeding, and the females after nesting. The drakes will not have bright colors when molting until they grow those feathers back. It takes approximately 6 weeks and then they are flying and bright colored again. Ducks do fly south for the winter season, some fly as far from Canada to Central America. They migrate in groups of 100 or so and do not fly in a wedge like geese do. They can fly as much as 330 miles a day and will stop at the same "rest" or refuge areas they did the year before. When ducks do land in a refuge area on their way south, it is called "migrator or flight day" and is usually very good when hunting ducks on public land, because the ducks born that year have not learned the difference yet between a refuge and the hunting areas. By the way, it depends on who you talk to, but a group of flying ducks are referred to as: badelynge, bunch, brace, flock, paddling, raft or team. The picture above is a drake canvasback duck also known as a "can." I can't get over the red eyes. Ducks have three eyelids in case you were wondering. Canvasback Ducks, Redheads, Mergansers, Ruddy, Bufflehead, Eiders, Ring Necked Ducks and Lesser Scaup. This group of ducks swim and dive underwater instead of tipping like the dabblers to search for food. Diving ducks are found in larger and deeper lakes and rivers. The colored patches are the wings are defiantly not as brilliant as the dabbler ducks. Many of the divers have short tails, so when they are flying they use their huge webbed feet as rudders. When in flight they do not tuck their legs up so you will see the feet on these ducks when flying. They will patter on the water before lifting into the air on take off. Speaking of webbed feet, ducks do not have nerves or blood vessels in their feet so they do not feel the extreme cold when swimming in icy water. And you guessed it, their feet don't bleed. This helped me when I was hunting ducks. They feed by diving and at times VERY deep in the water. To avoid danger, diver ducks travel long distances under water and will poke their head out before diving down again to flee. The diver ducks wings are small in comparison to their body size and weight so they flap a lot faster than the dabbler ducks. They love fish, shellfish and aquatic plants. 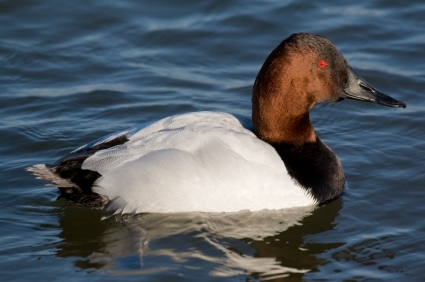 Canvasbacks and redheads love eel grass and wild celery. 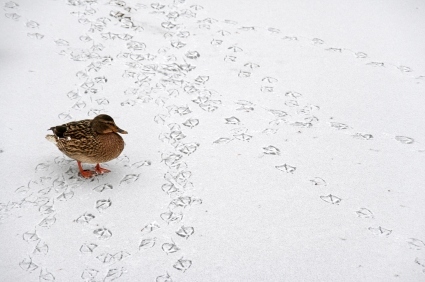 The picture above is a mallard duck and other mallard tracks. So if you are looking for duck activity when hunting ducks and are scouting for ducks, this picture gives you a good idea on what to look for. I am a visual person, so this helped me tremendously. Duck hunters usually spend a lot of money on their huge assortment of equipment for scouting, luring and shooting ducks. They hide themselves in boats, pits and hidden blinds that are place by water and near feeding areas. Decoy spreads are then placed in and around the waters edge to lure in the ducks to a specific "landing zone." This is an deliberate and specific open area in a duck decoy spread that approaching ducks can land in. There are a couple different kinds of hunting boats that you can purchase when hunting ducks. The sneak boat or the jon boat. Below, you will find instructions on how to make your own sneak boat, duck and goose blinds when hunting ducks.